Booking Activities’ booking list used to be loaded when you clicked on an event, allowing you to filter bookings only by events. The new version 1.3 changes it all, it now now very simple to search for specific bookings. 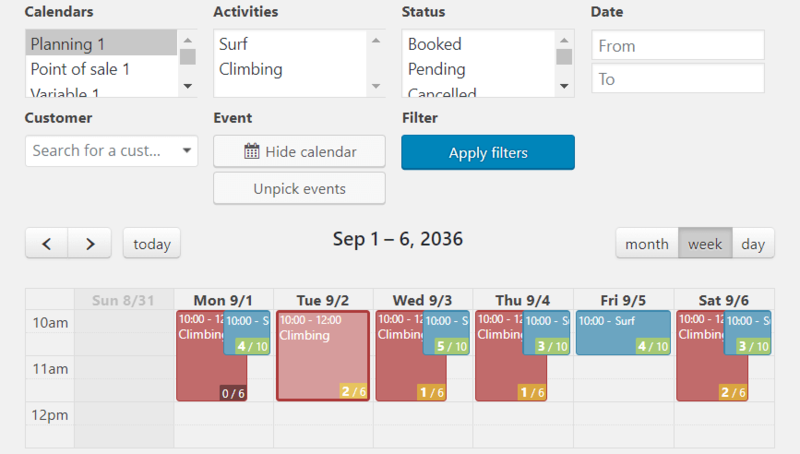 You can filter the booking list by calendar, activity, state, user, and dates. You just have to pick one or more of them and then click on the “Apply filters” button to filter your booking list accordingly. If you press the “Pick an event” button, the calendar of your bookings will appear. The events appearing on this calendar are also filtered dynamically according to your current filters. You can click a (group of) event(s) to filter the booking list by event, just like before. You need to “Apply filters” after clicking the event though. On the top of the Bookings page, you will find a “Screen options” toggle. There, you can choose which column to display in the list and how many bookings will be loaded per page. Don’t forget to apply the changes. 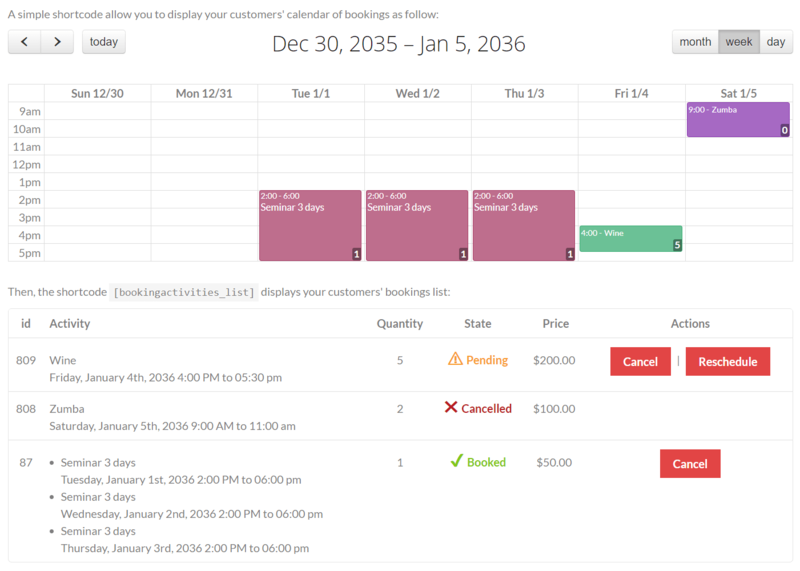 Your booking list is sorted by creation date by default. You will see the newer bookings first. But you just have to click on one of the column title to sort the list accordingly. Click it again to reverse the sort order. Booking groups are now displayed along single bookings. The “group” mention is added in the “id” column to highlight them. When you want to display the bookings bundled in that group, just click on the button meant for that purpose and they will appear right below, visually grouped. Booking Activities always had a “Pending” and a “Booked” status. You could then let unpaid bookings as “Pending” as consider that “Booked” bookings are paid. But you, or a customer, can cancel both paid and unpaid bookings, so how to differenciate them? Now you’ve got the solution, Booking Activities will let you mark bookings as “paid”, “owed” or “no payment required”. To do so, click on the “edit state” button in the booking list and change its payment status. With WooCommerce, the payment status is changed automatically according to the order state and whether the user has paid online. 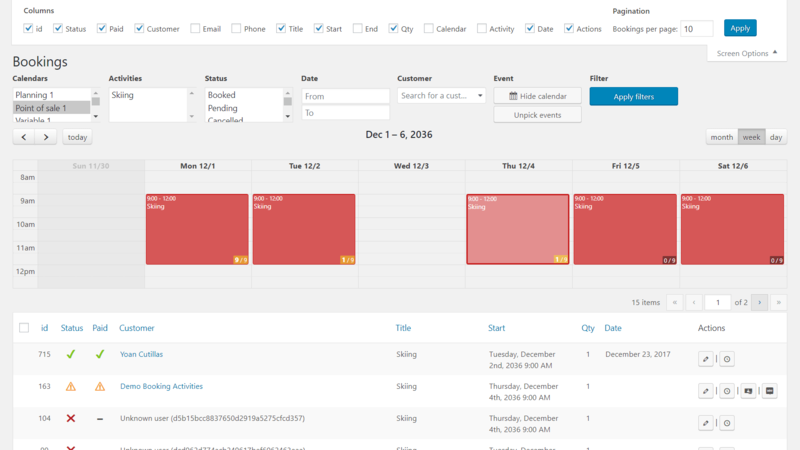 You can display your customers’ booking list with a shortcode, right? Now you can also display a calendar containing only the events they have booked! The shortcode to use is [bookingactivities_calendar bookings_only="true" user_id="current" past_events="true"]. A promise is a promise, you have now much more text to customize in the settings, “Messages” tab. It is important that you can speak to you customers with your own words, that is why we will continue our efforts in this direction. One important thing is to be noticed: the old “Date format” setting has been replaced by a lot of more precised date formatting options. You will find them in the “Messages” tab. 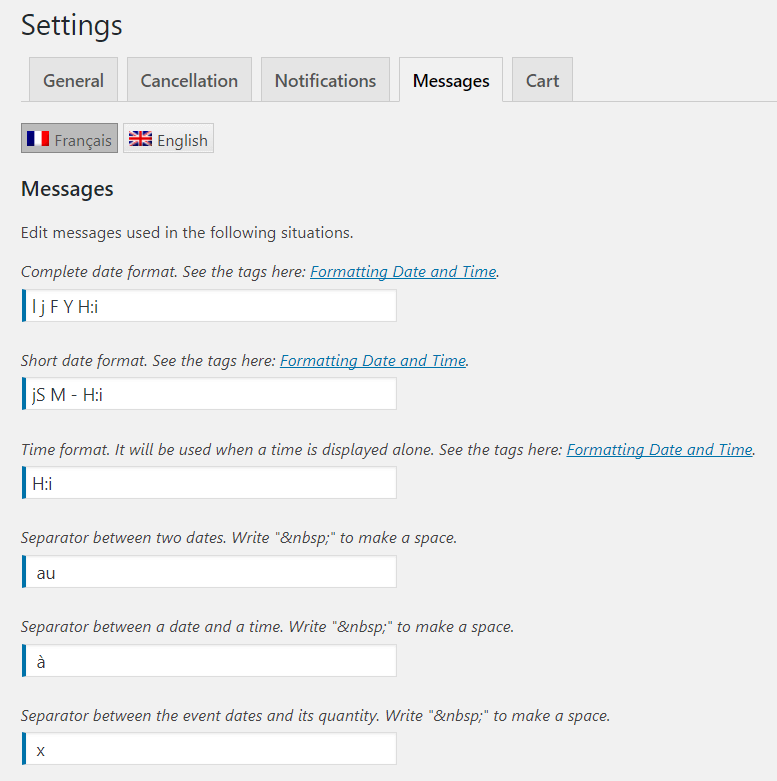 Now you can truly set how dates, times and intervals will be displayed on your website. Booking Activities features a unique cart expiration system when it is used with WooCommerce. It protects the bookings your customers have added into their cart until they proceed to checkout. Now if you choose to deactivate it, the availability check will be done at checkout validation. It means that an event available at the time it is added to cart can be unavailable when the customer tries to validate his order if someone booked it before him. Both modes of operation are valid, the choice is yours.